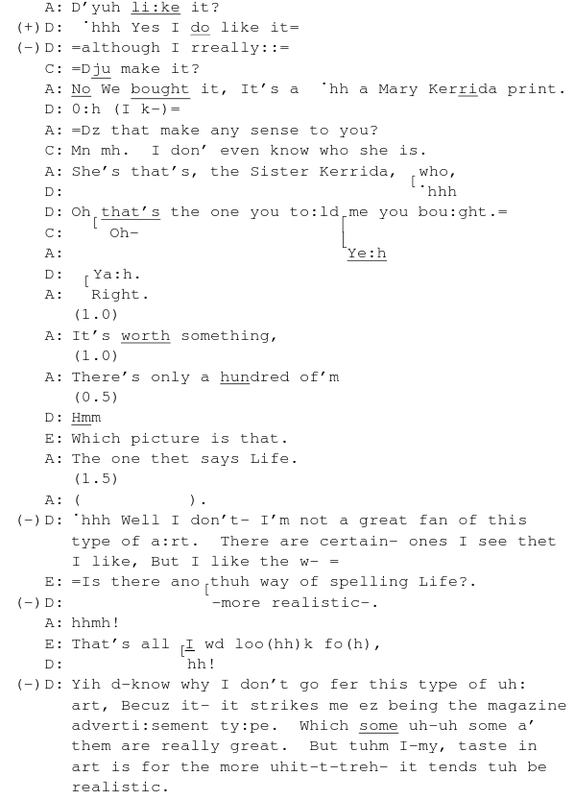 I found this conversation in Pomerantz’ paper over a year ago, and began to examine the detail of the exchange: how the participants manage thier assessments of the print, and what kinds of conversational devices and mechanisms they use to do so. I never really thought to find out what they were talking about until I started working on the Audio BNC (my post about that here) and kept hearing lots of mis-transcribed names of artists and musicians in people’s conversations. I had started searching for Mary Kerrida (sic) and even thought it might be a mistranscription of ‘querida’, and they were looking at some kind of religious print or icon of the Virgin. It just never occured to me, reading their conversation, that they might be talking about a piece by Sister Corita Kent, the peacenick pop-art nun. When I found this print ‘Life’, I was struck by how little relevance the image seemed to have to the conversation, and how few identifiable descriptions appeared in talk. 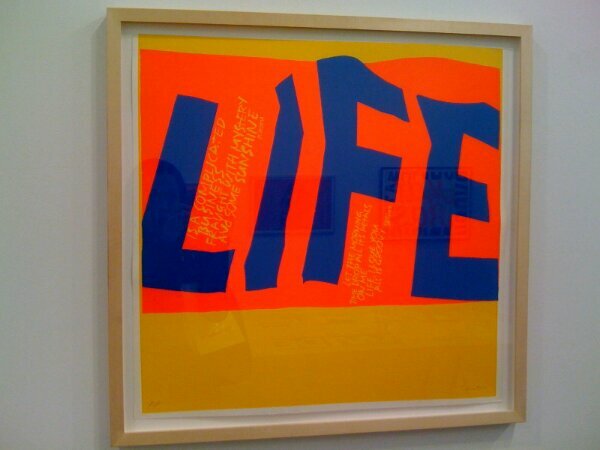 The only reference that enabled me to identify it (or so I think) was the question from participant E, querying the spelling of the word ‘life’ – a conversational/perceptual repair of sorts. In fact when analysing this conversation, Pat Healey and I had to accept that there was no real evidence that E’s question was even part of the overall conversation at all. That’s still the case I guess, and I can’t prove that they’re talking about this image, but this process, of reading a decontextualised transcript of a critique first, then finding the artist, then finally the image being critiqued, has been a useful case in point for a conversational aesthetic approach.